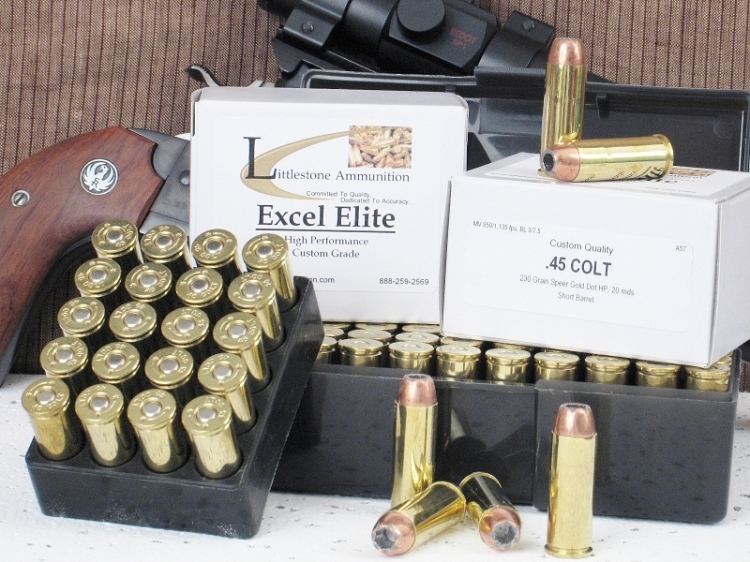 A generic photo of twenty- and 50-round boxes of Littlestone Ammunition. Firearm not included. This is 50-round box features a hard-hitting hunting load for your .44 Remington Magnum revolver that is designed to take down most big game. It sends a 270-grain Speer Gold Dot bonded-jacket soft point bullet down range at 1,275 fps and delivers 975 foot pounds of energy at the muzzle. The bullet's copper jacket is bonded to the lead core at the molecular level, so these bullets retain more than 90 percent of their weight to drive deeply into the target. And because the soft point is built with Speer's memory line technology, it produces reliable expansion, but only after penetrating more than a hollow point. We've also loaded it on a nickel-plated case to stand up to harsh hunting environments without corrosion. Feature 3: MV / Energy / Barrel: 1,275 fps / 975 ft lbs / 7.5"